The stonework part of this lovely castle was built in the late 16th Century, and the extension building attached to its left hand side as we see here was added in 1700. At left is the Old Fordyce Church. St Talarican, or St Tarquin, was a local man who was made 'Bishop of the Isles' in around 720 and established an early church here. The one shown here was built in the 13th century. People who are familiar with Fordyce will notice that a little artistic license has been used to uncover the kirk from behind a screen of trees here! 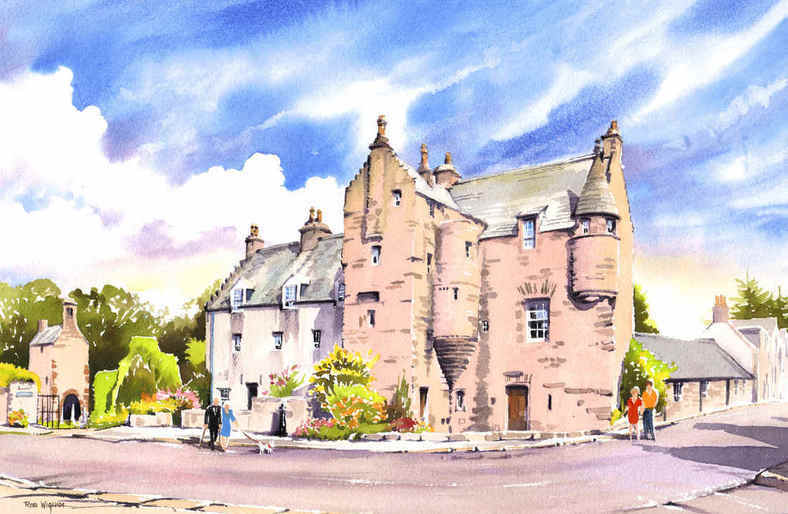 The Castle and Kirk add history to this beautiful village only a couple of miles from Portsoy.